The part state-owned bank made a profit of £288m in the first quarter, but PPI claims continue to eat away at earnings. Compared to a £3.5bn loss in the same quarter last year, Lloyds posted a healthy set of figures today. But the fizz was slightly flat. The bank was forced to set aside another £375m for Payment Protection Insurance (PPI) claims, bringing its total provision for mis-selling the controversial product to £3.6bn. It’s a 12% rise on the £3.2bn the bank had already set aside last year. António Horta-Osório, the bank’s formerly weary chief executive, blamed claims management companies for fuelling a rise in complaints. He said a quarter of claims they put forward were from customers who didn’t even have products with the banks they were claiming from. Profits had also fallen from the previous quarter, when Lloyds made £316m. The £288m it made this quarter was also widely off analyst expectations of £500m. And it seems the PPI headache could get worse soon - Horta-Osório didn’t rule out any further increases to the pile set aside for compensation. Barclays also put up its provision last week. Lloyds, which is 40% owned by the government after being bailed out during the 2008 financial crisis, nevertheless had some positive news about its progress in repaying government loans. It now has £12.9bn of Treasury-guaranteed loans left to repay. That’s down 45% from the end of the year and compares to the £157.2bn it borrowed from the taxpayers in December 2009. Lloyds has been cutting costs and reining in bad debts to get back on the path to recovery. A few months after Horta-Osório took his place in the hot seat last March, he announced he would trimming back. Two months ago 1,600 posts were shed as part of the bank’s plan to cut a total of 15,000 jobs. In total, Lloyds and government-backed RBS have reduced staff by more than 50,000 since the financial crisis. 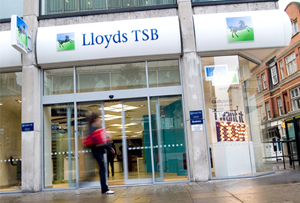 Lloyds is aiming for £1.5bn in annual savings by 2014.